1. Address the behavior or performance problem. Directly address the problem before you terminate an employee, whether it be a behavioral issue such as attendance, tardiness, conduct, attitude, or inappropriate behavior; or poor performance. Approach termination with fairness by bringing the problem to the employee's attention, counseling or coaching them on understanding the problem and disciplinary consequences if they do not change, and providing the necessary training and support for improvement. Use internal counseling or mediation to try to resolve the problem or change the behavior. Refer the employee to an employee assistance program (EAP) if the problem warrants outside assistance. Avoid making assumptions about the reasons for an employee's behavior (i.e. employee has a mental/emotional issue) and acting upon them. If you have a discipline policy (recommended), follow the steps. Reiterate performance expectations and/or standards to the employee. Counsel the employee on performance gaps and uncover the reasons for those gaps. Create and document a performance improvement plan or a set of steps to improve performance. Follow-up on the performance improvement plan or set of steps within a specific timeframe. If you have a discipline policy for performance issues, follow the steps. 2. Compile/review all written documentation and seek legal consult. Past performance evaluations, emails, employee files, etc. In all of these situations, proceed with caution, be conscious of timing, and seek legal counsel before terminating an employee. Additionally it's especially crucial to have written documentation supporting that the termination is based on specific behavioral or performance issues and not related to a disability, condition, or other unrelated factor. 3. Plan and prepare for the termination. Prepare the termination letter, review it with legal counsel, and plan a private termination meeting, including at least one other individual as a witness. Carefully consider timing and location of the termination meeting...do not plan the meeting amongst other employees, around holidays, etc. Write a script, rehearse it, and keep it very short; but be sure to include a few fact-based reasons for termination. Finally, keep the termination meeting professional. Avoid emotionally-charged responses which can lead to lawsuits. You will also need to prepare administratively for the termination. Calculate severance (if applicable). Write a severance letter. Discuss or provide information on health insurance continuation under COBRA. Arrange for payment of accrued vacation time, company expenses, retirement, and other company benefits owed to the employee. Provide a list of company belongings to be returned (keys, credit cards, laptop, materials, tools, cell phone/mobile device, furniture, records/manuals, and other property). Arrange for changing security passwords and departure from the facility. Deactivate computer network and phone access. Communicate the employee's departure. Keep it simple. Allude to the employee no longer being with the organization, who will be taking on his/her duties in the meantime, and who to contact with questions or concerns. A termination can be a lengthy, arduous, and legally-risky process, and one that organizations should avoid with sound hiring practices, performance management, and supportive training and development practices that help employees succeed and meet their goals. 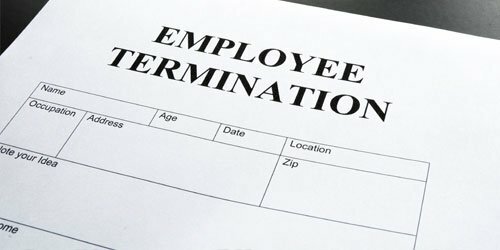 Nonetheless, if your organization finds itself needing to let go of an employee, be sure you follow these practices to ensure a smooth and compliant termination that keeps you out of court. ERC's Preferred Partner, Ease@Work, provides employee assistance, work/life and wellness services to companies throughout Ohio with employees throughout the United States. ERC members receive one free management referral or consultation and one free seminar annually. CareerCurve, ERC's Preferred Partner, delivers outplacement and career transition services to individuals and organizations.